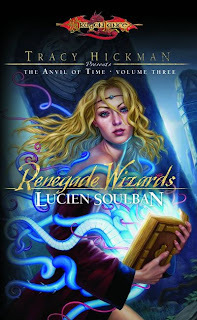 As the third installment of the "Tracy Hickman presents..." series, Renegade Wizards by Lucien Soulban does not dissapoint! The first in the series was The Sellsword by Cam Banks and the second was The Survivors by Dan Willis. I personally had never heard of Lucien Soulban prior to this March 4, 2009 release, but fans are going wild already! He finds Tythonnia, a young red robe learning magic in company with Ladonna of the black robes and Par-Salian of the white. The three are sent on an easy quest to find the leader of the renegade wizards, a man named Berthal, but if it was that simple, they wouldn't need mages. Instead, what started out easy turns into betrayal - magic against sorcery, the wizards against each other, and Tythonnia against herself. When Berthal finally unleashes his final attack, everyone knows that it won't end that simply. Wizards of the Coast has provided a sample chapter on the product page of Renegade Wizards. Check it out and let me know what you think!